This was my favorite book thus far in the series. I've struggled a bit at times in some of the first books, but this was the first one that I blazed through because it held my attention the entire time. 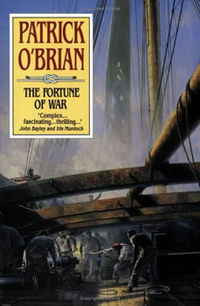 Maybe it was because I just finished the Ian Toll book which dove heavily into the War of 1812. Maybe it was because I'm finally used to the sea-jargon. There were a couple of parts that I really liked. This first one has to do with Jack and his crew surviving a fire on board the ship after which they must endure the weeks at sea on a small boat. "A little after moonrise Stephen woke. Extreme hunger had brought on cramps in his midriff again and he held his breath to let them pass: Jack was still sitting there, the tiller under his knee, the sheet in his hand, as though he had never moved, as though he were as immovable as the Rock of Gibraltar and as unaffected by hunger, thirst, fatigue, or despondency. In this light he even looked rock-like, the moon picking out the salient of his nose and jaw and turning his broad shoulders and upper man into a single massive block. He had in fact lost almost as much weight as a man can lose and live, and in the day his shrunken, bearded face with deep-sunk eyes was barely recognizable; but the moon showed the man unchanged." Again - POB does a great job describing and painting Captain Jack Aubrey. Another passage I got a kick out of was when POB was describing how couth Diana had become in a life among men. "A few more years of this company, and she would not scruple to fart." A just a couple of other comments ... my heart rate quickened when Stephen was reading Johnson's papers when two French agents came in at two different times. He quickly and coolly killed them. Maturin is an amazing and complex character and him taking out these two French agents made me wonder if he was the original 007. And the other comment was the happiness in reading the note Diana had written to him ... they she would happily marry Stephen. The poor fellow, after that rough night, got some good news!